… is the rather innocuous sounding name we have given to a fruit that the French have seen fit to dub much more alarmingly – Cul-de-Chien (Dog’s Arse). As you can see, it’s not hard to imagine how such mischievous names for these little fruits came into being – the five-tailed open end (known as a ‘calyx’) has that unmistakeable tea towel holder/balloon knot/dog’s arse appearance. Thankfully, though, I can absolutely assure you that it is only down to this appearance that the Medlar has acquired its more funky nomenclature, for its flavour is (contrarily I’m sure) quite divine. 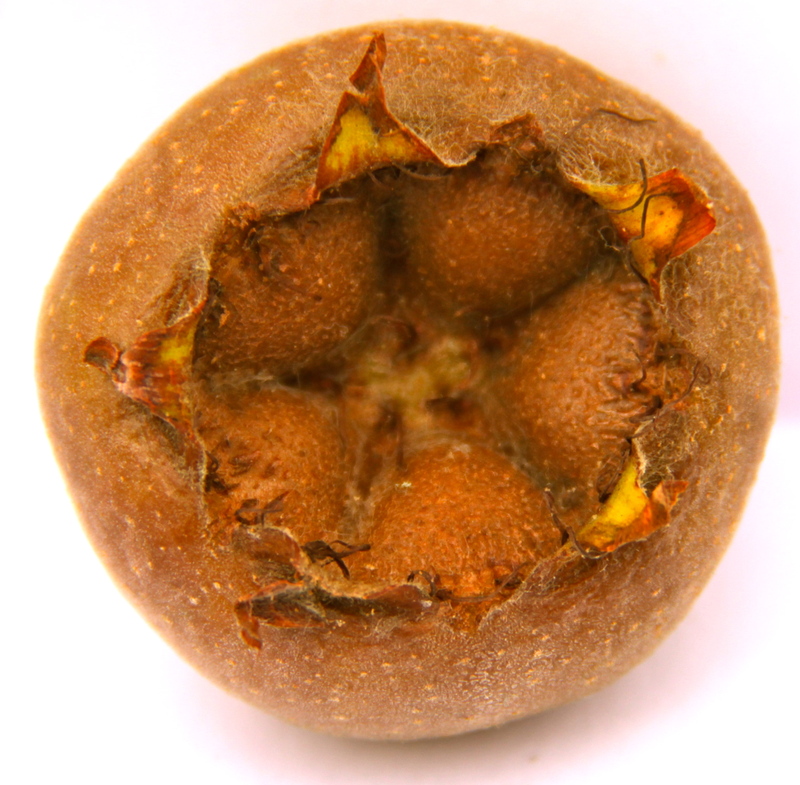 I hope everything I’ve told you thus far should leave you in absolute confidence as what to look out for when hunting for Medlars – if not then just follow your nose! (I’m joking, of course, but further pictures and description can be found on my Edible Fruits A-Z page). 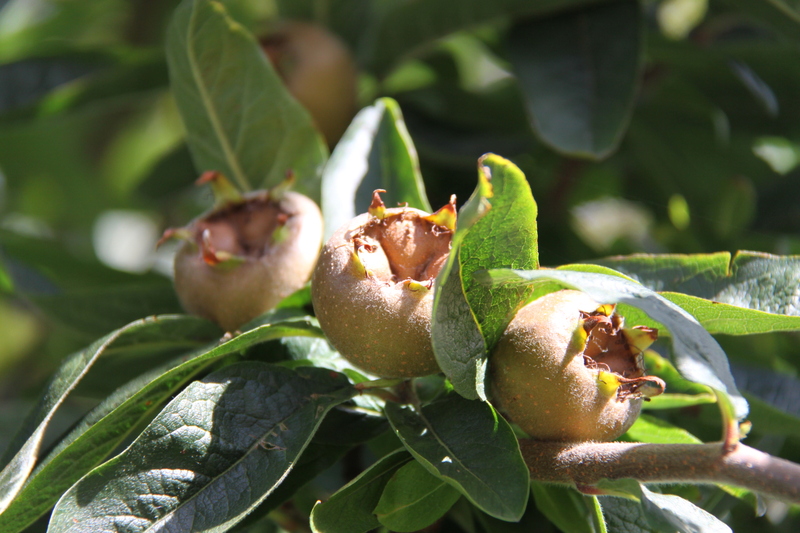 The Medlar Tree is a Mediterranean plant and the fruits will not ripen on the branches in our more temperate climate. You will therefore have to pick (or scrump) them when still hard and store in a bag or box for a few months until they have bruised, softened and basically rotted a bit (a process known as ‘bletting’). The flesh when ready to use is a lovely brownish-caramel colour, and the taste almost datey but slightly sharper (it’s quite unique, in fact). I always make a Medlar Jelly with my bletted fruits, and it is certainly the richest of all the hedgerow jellies available to the forager. At the moment my fruits are still softening up, so I shan’t give you the recipe until they’re ready. In the meantime, though, I suggest you peruse fellow WordPress Blogger Ichykoo’s recipe for Lamb Chops with Spiced Medlars and Red Wine Sauce – now, I wouldn’t turn my nose up at that! This entry was posted in Fruits & Berries and tagged cooking, edible fruits, family activities, food, Food For Free, foraging, free food, Medlar Jelly, medlar tree, Medlars, tea towel holder, wild food. Bookmark the permalink.